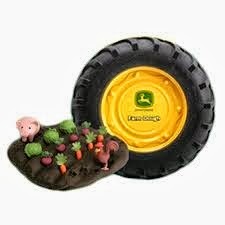 Flip Out Mama: Holiday Gift Guide: Uncle Milton John Deere Toys! Our next Holiday Gift Guide feature is from one of our very favorite brands! Uncle Milton is a great company that we have had the pleasure of working with several times over the years, and they just keep coming out with great products! One of my favorite things about Uncle Milton is that most of their toys are creative or science based, which I love! That is something that really makes me want to buy a toy, if I know for a fact that there is an educational value in it! The John Deere Bug Jug from Uncle Milton is a great new toy, perfect for your little scientist or bug hunter! 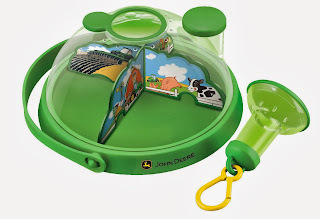 It has a magnifier for checking out bugs up close and personal, a fun farm design, an observation dome, carrying handle, even air holes so your buggy friends can breathe while you observe them! What a fun toy! The boys are crazy about this one, even though mommy doesn't really like to play "bug hunt" too much LOL! You can check this great toy out HERE! Our next great Christmas product is Farm Dough! It is like that other dough, but MUCH cooler and MUCH cuter! The John Deere Farm Dough set from Uncle Milton is a great gift! It comes in an adorable tire case, and it's not just the dough! The set also comes with 2 animals and 11 vegetables! It's so cute! Your little ones can play garden or farm, or anything! Check out Farm Dough here! As you can see, Uncle Milton has some of the greatest toys out there! You can check out all of Uncle Milton's offerings on their website, and make sure to follow them on Facebook and Twitter as well!